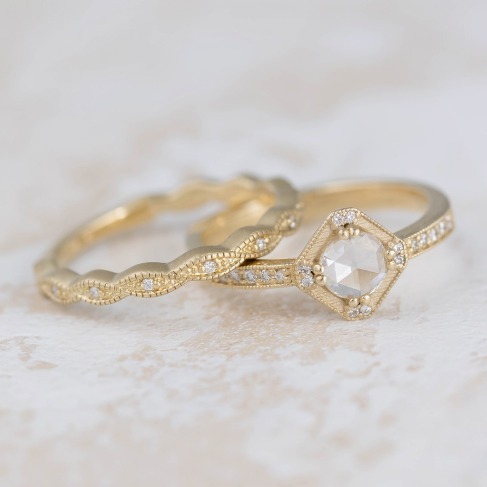 This little Art Deco beauty is our new Emmaline Ring. It has romantic swirls, a laural wreath and tiny daisies. Delicate diamonds trail down either side. Elegant and timeless. 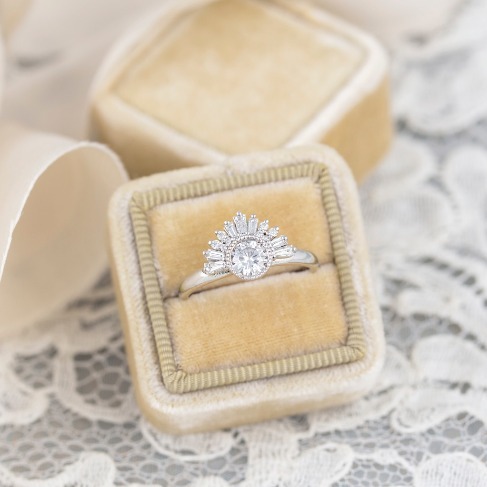 Your engagement ring is one of the most precious pieces of jewelry you will ever own. Every time you look at it, you want to be reminded of the time you said 'Yes!' to the one that you love, to your journey as a married couple & to where you are now. 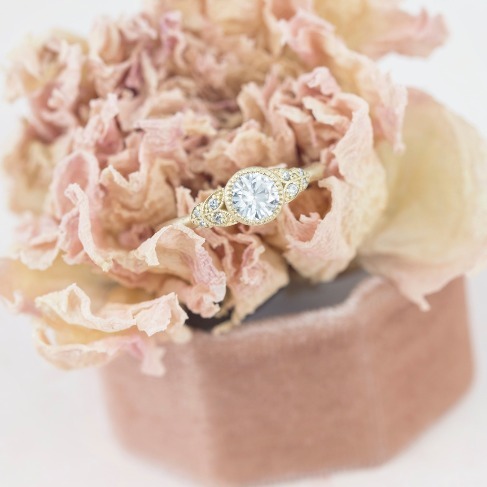 Make your engagement ring memorable with this stunning Dahliilah Halo Ring & you will always be reminded of the start of the rest of your lives together! 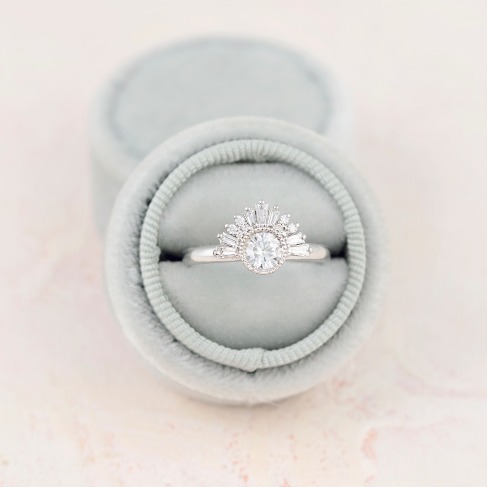 Swooning over this Art Deco beauty...reminds me of something out of The Great Gatsby 💕 Our Aurora ring in 14k white gold. For the girl who dreams in wildflowers...This pretty little thing is our Mirabelle Ring which in french means "wonderous beauty". It has diamond wildflowers on the sides and leaves trailing up the shank. I know I am not supposed to say this but it is one of my favorites. Can be customized to your hearts delight. 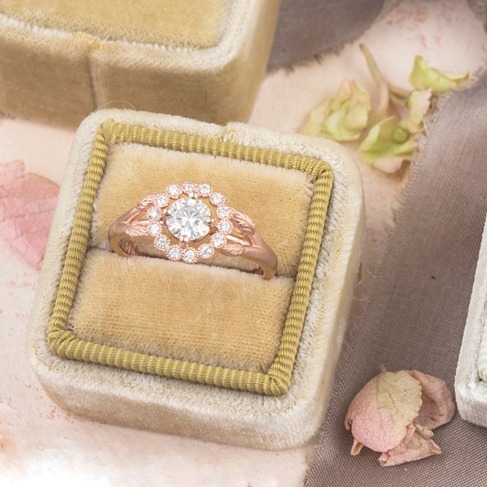 Once in a while, right in the middle of an ordinary life, love gives us a fairytale..." The ring worthy of fairy tales...Our Scarlett Ring with a delicate diamond bezel and lots and lots of diamonds. Swoon-worthy. 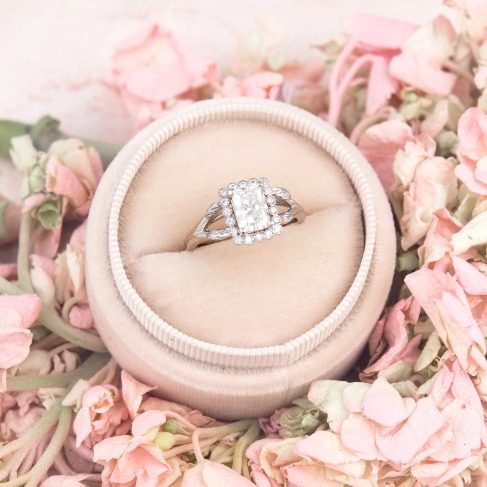 Looking for the most beautiful engagement ring? Here is one of our favorites! 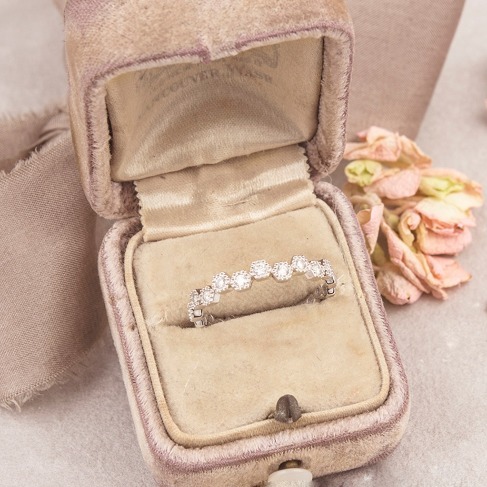 The Beatrix ring with a gorgeous rose cut diamond which adds a vintage feel to this ring. We can also create a custom design for you. 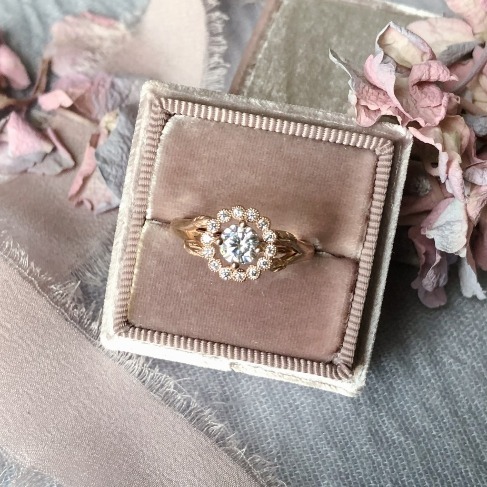 One more reason to be in love with 18k peach rose gold, Our Gwendolyn Halo Ring inspired by the Belle Epoque era is so delicate & romantic. Bring on the pretty...and a little spring wouldn’t hurt either. Besides being obsessed with Hydrangeas, this little beauty isn’t so bad all by itself. Our Vivianne ring set in white gold and sparkly diamonds, of course. 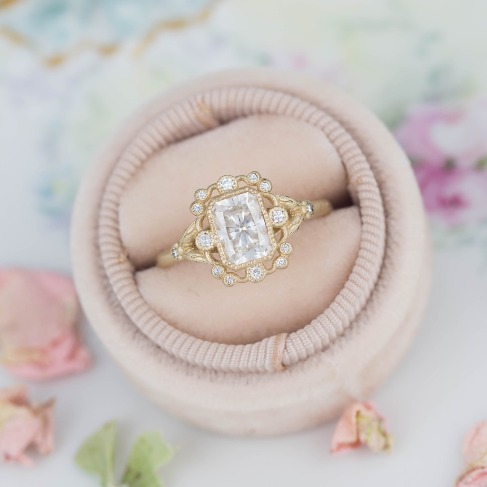 Enamored with this little Art Deco beauty that we call Claudette. 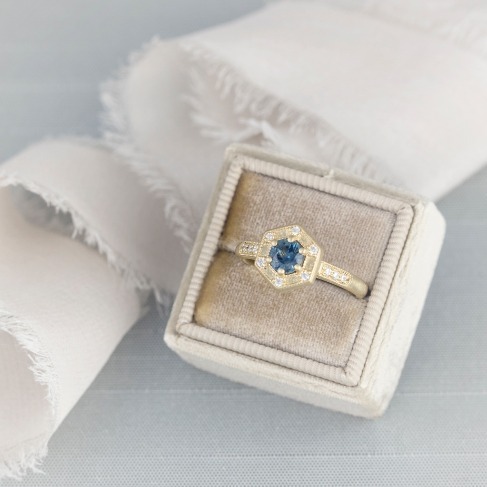 It has a Teal Montana Sapphire and delicate diamonds around the edges. Our Joesephine ring ~ Fit for a queen. A sweet little something for your love. 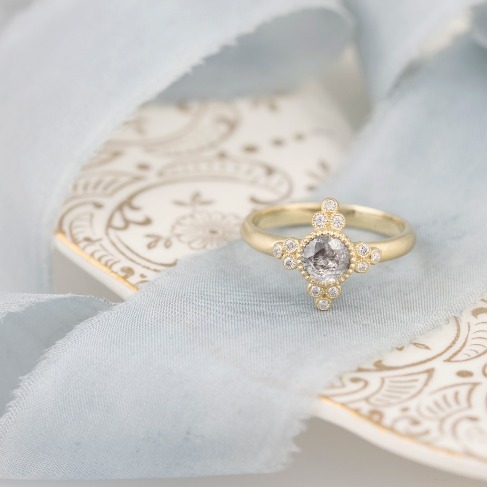 Our vintage inspired Viola ring with a delicious 1ct diamond. So delicate and charming. Perfect in its romantic detailing. 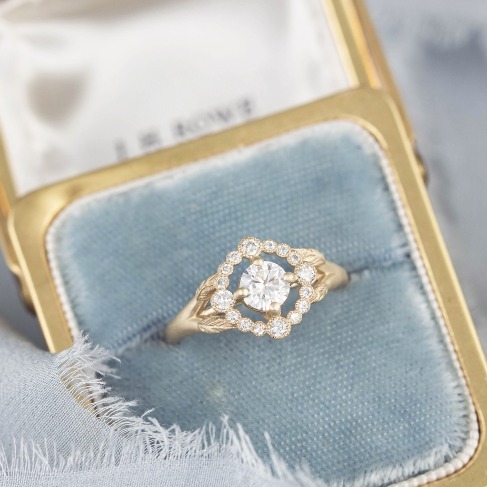 Smitten with Art Deco rings? You are in the right place. Our Greta Ring paired with the Thea Band. Be still my heart. Obsessed with this Art Deco beauty. 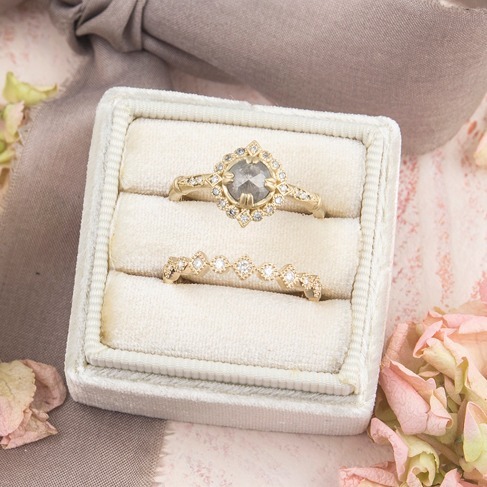 Our Aurora ring reminds me of a tiara fit for a princess. Set in white gold with diamonds, diamonds and more diamonds. So if you like diamonds this one is for you. Can be fully customized just for you! Just finished these beauties...A beautiful grey rose cut diamond set in a vintage inspired halo with tiny hearts on either side. 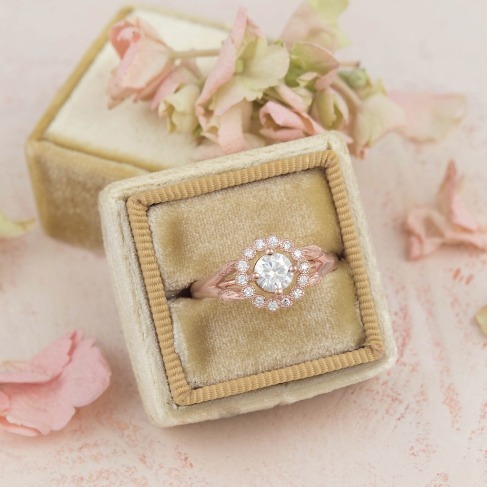 An organic rose gold wedding band with a solitary diamond representing their love. 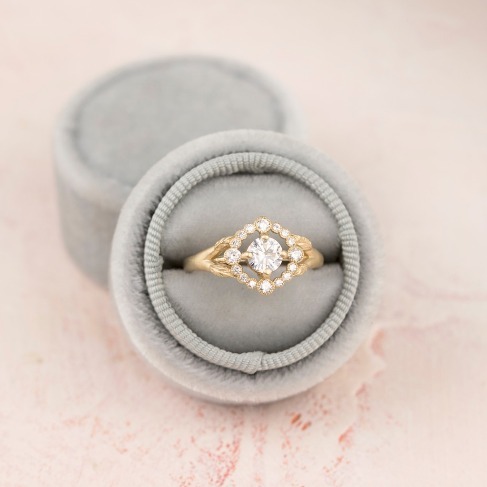 How bellisimo is this ring? 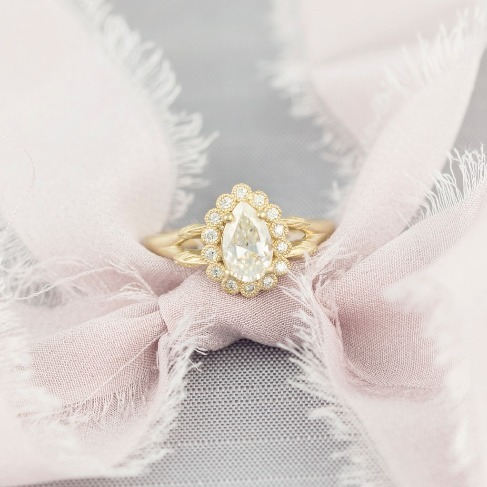 Our Penelope ring is so delicate and romantic with its unique pear shaped diamond halo. The dreamiest. Pear shaped stones are very popular right now and we just love them. Rose gold ring goals. 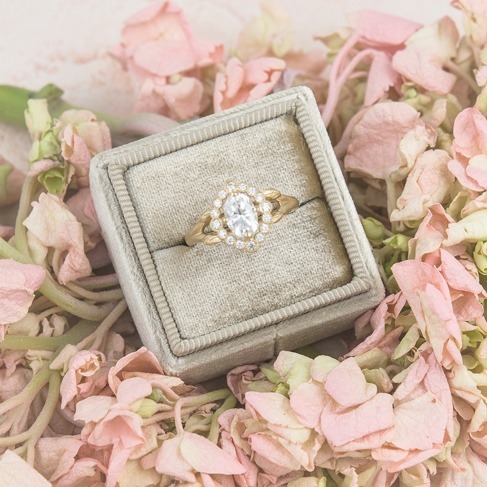 Our Gwendolyn ring is a vintage inspired halo with trailing leaves and a delicate bezel halo that floats around the center stone. Shown in 14k rose gold. 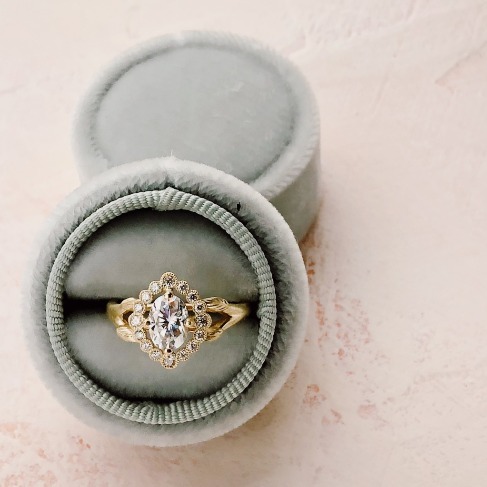 This ring can be fully customized to your hearts content. 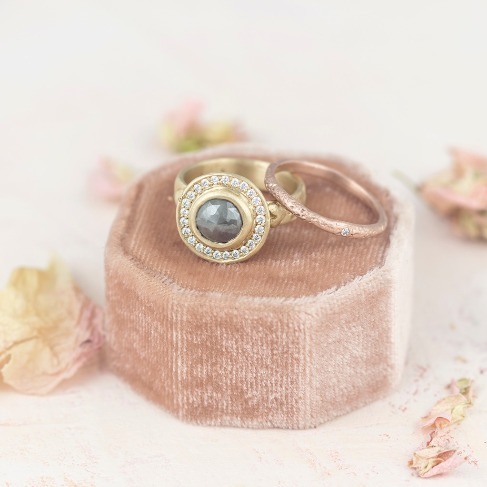 "The first time I saw you my heart whispered...that's the one..." Our Antoinette ring set in 18k gold with a Grey rose cut diamond which just sparkles in an old world way. I love these colored rose cuts as they glow and are translucent as if being seen under candlelight. Enchanting is a good word for them. Each one is so unique, no two are ever the same. Can you tell I love them? 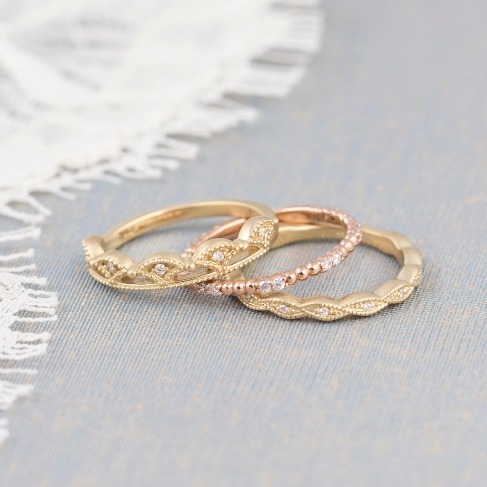 Stack attack...Have you seen our new 2018 collection of wedding bands? They also make great stacking rings! Crushing on the new crown one myself. 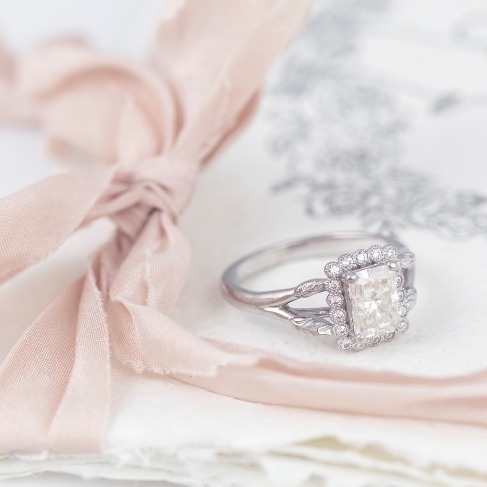 ll kinds of wonderful...Our Vivienne Ring with an emerald cut diamond and vintage inspired halo. It really does all start with the ring. 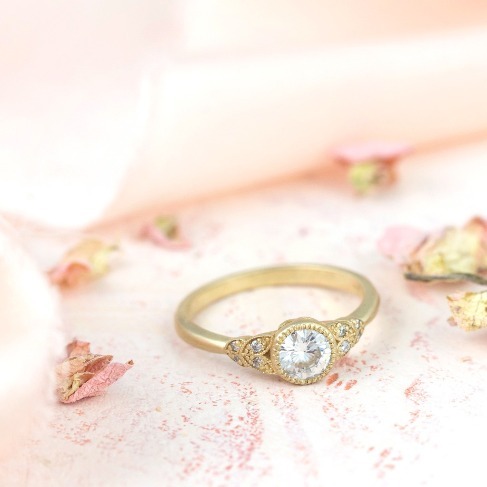 Our Dalilah vintage inspired halo ring in 14k gold. 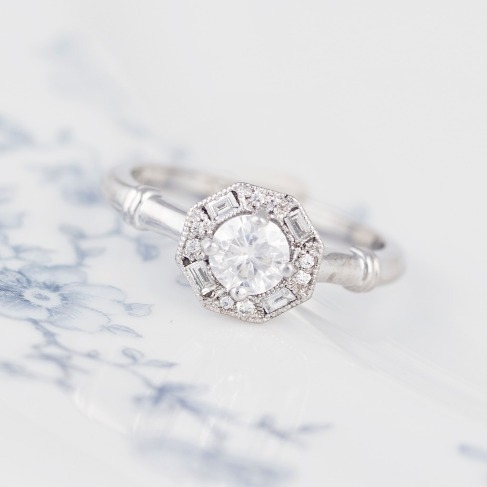 Did you know we also can work with your heirloom diamonds and design a bespoke ring just for you. 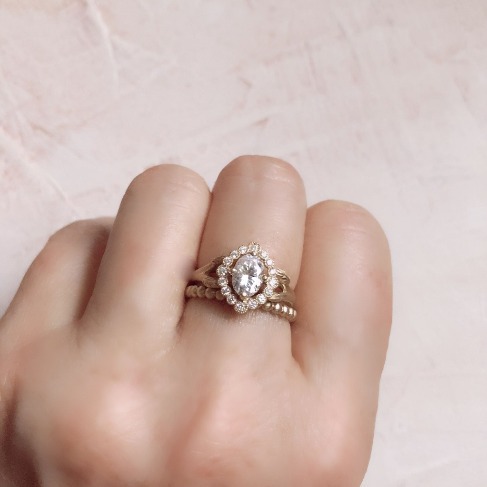 Obsessed with this sweet little Art Deco wedding band we call Thea. 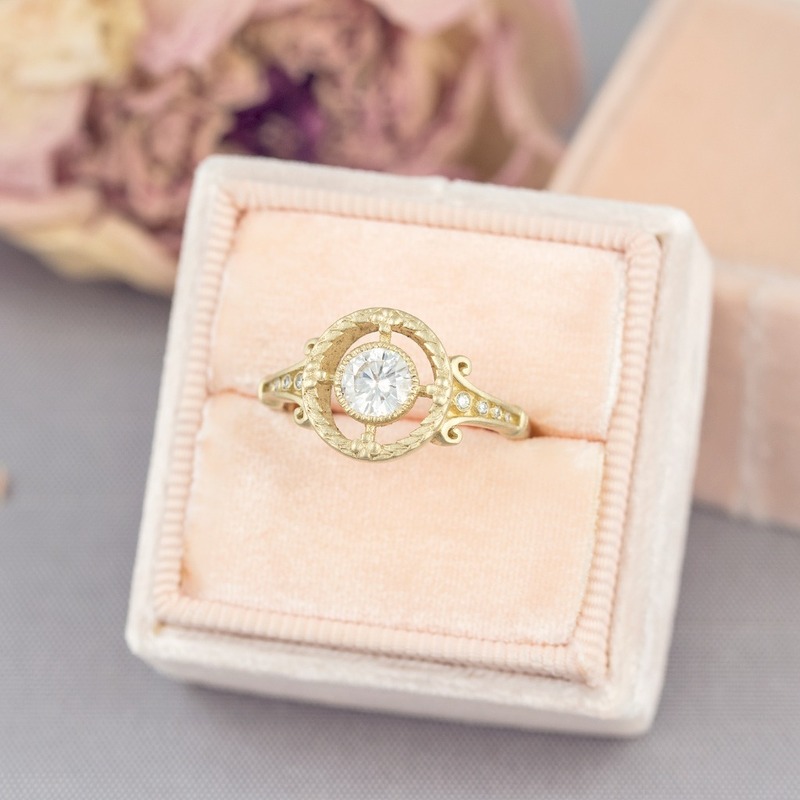 Check out our website to see all of our Art Deco and Vintage Inspired Rings. 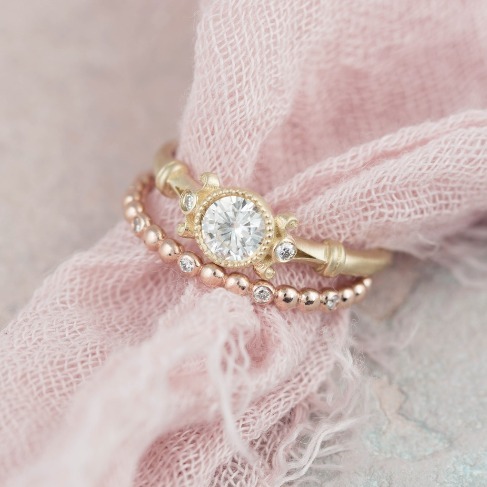 The Dahlilah Ring and the Dewdrop wedding band. A true vintage style Edwardian Era treasure. I get to make this engagement/wedding ring for one of my favorite people in the whole wide world (with a few modifications because we are both obsessive about details like that). How great is my job? 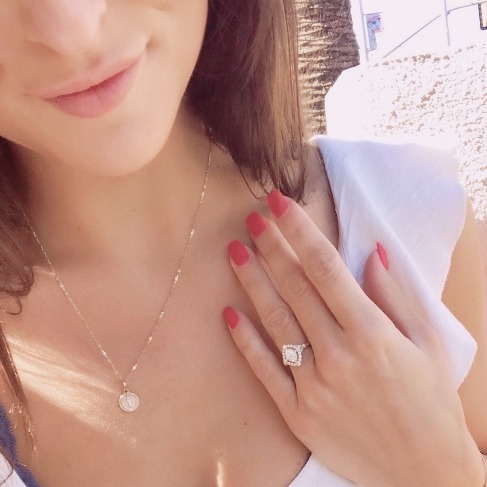 I don't know if I am more excited that she found the man of her dreams or that I get to make her ring for her. 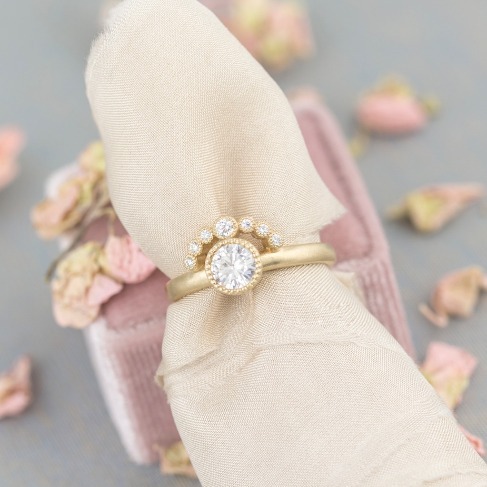 "You are my sun, my moon and all of my stars" ~ee cummings I read this quote this morning and it reminded me of our Adeline ring with its delicate half halo of diamonds that sits above like little stars. Yes, please! The Aurora Ring, named after the Northern lights. One more reason to be in love with the glamour that is Art Deco. A beautiful .50ct diamond center stone is surrounded by a half halo of diamond baguettes. What's not to love? A little something for your ring goals. 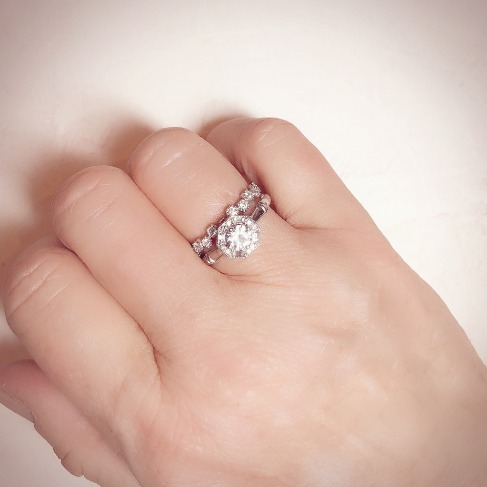 Are you in love with the look of a simple solitaire but then again you don't want it to be boring? 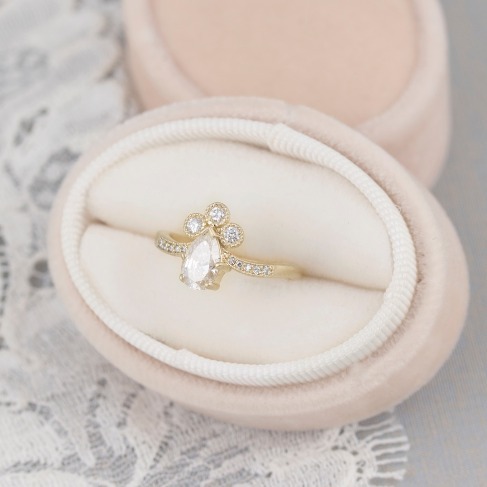 Our dreamy new Viola ring is the perfect combination. Because no one is too old for fairytales. 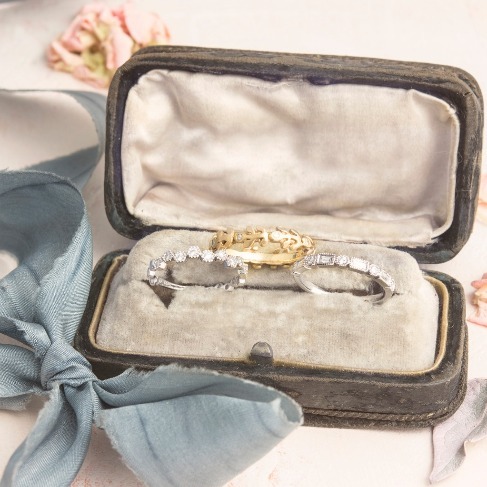 A few of our lovely vintage inspired wedding bands that pair perfectly with almost any of our rings. This little Art Deco beauty is our new Greta Halo Ring set in 14k white gold with baguette diamonds. 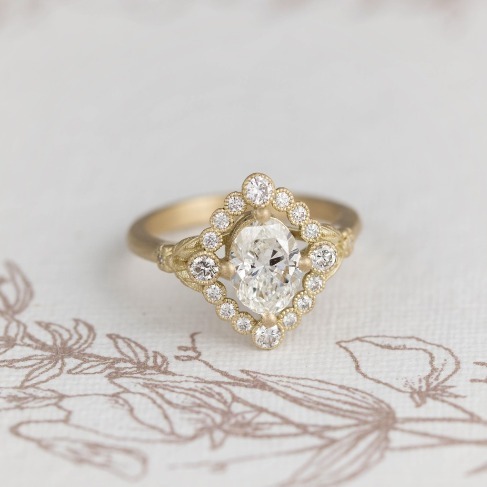 Our Vintage Inspired Dahlilah Halo Ring in 18k gold with an amazing 1ct. oval diamond. So dreamy. 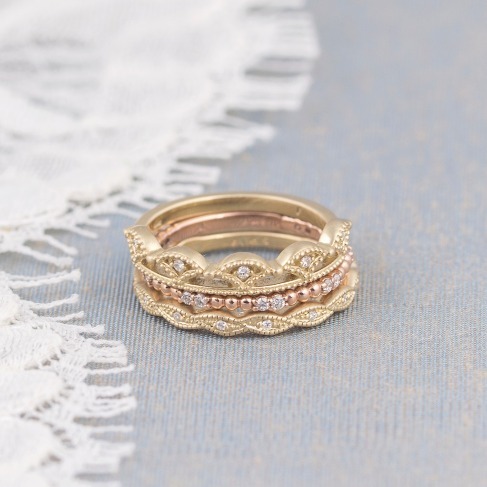 Our new vintage inspired Gwendolyn Ring in 14k Rose Gold. It has delicate migrain detailing around the halo and leaves trailing up either side which gives it perfect romantic detailing.